Part one of our two part travelogue. At the time of writing it seems longer than just a week since we returned to Menorca after our visit to three of the most historic cities of Spain. Monday 24th. November, and our Spanair flight arrives in Madrid on time, we retrieve our luggage and are met by our members who had earlier flown directly from the UK to join the group. Our coach awaited and we were soon on our way north on the 75 minute transfer to our base in the World Heritage City of Segovia. So our adventure begins. The Hotel Linajes was to be our home for the next 5 nights. Originally a family home dating from the 11th century and refurbished and extended in the 17th century this was converted into an hotel just 12 years ago and is situated in the ancient heart of the city where coaches and other large vehicles would find it impossible to manoeuvre and are in fact banned. We soon determined that David was to be our coach driver throughout our stay and about 20minutes from our arrival at Segovia he suggested I phone the hotel reception to arranged for their van to meet us at the nearest access point outside the city walls to transfer our cases but not, unfortunately, us. By now it was dark and following the van drivers instructions we climbed a cobbled street for some 500 metres to arrive at the reception where we were efficiently allocated our rooms. Dinner for all at 8.00pm we were told, giving us plenty of time to settle in and get over the exertions of our climb. Everyone was down at the bar in good time for a pre-dinner drink and voice their thoughts on our unusual arrival. The hotel had arranged a one sitting evening meal for us as a group and this was in the typical Spanish style. Different on each evening, wholesome but traditionally lacking the vegetables with the main course that those who remember Menorca or Spain of years gone by are accustomed to. 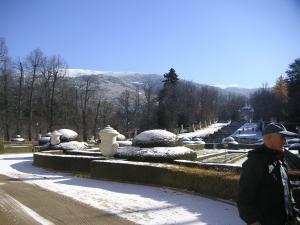 At this time I contacted our local guide Maria del Barrio and as the weather forecast was showing low cloud, fog and snow for the following day we would perhaps change the first scheduled excursion being our scenic mountain tour “Pueblos Serranos” to the visit to the city of Ávila due later in the week. Maria who was to be our guide throughout the week readily agreed. A lady, it turned out, with an infinitive knowledge of not only her home city of Segovia, but also of the provincial cities of Avilá, Salamanca and the surrounding villages; The cathedrals, churches, buildings and façades together with their tapestries, glorious paintings and murals. In fact given more time Maria could bring the whole history of Spain to life, especially the region of “Castles and Lions”, Castilla y León where we were. Tuesday 25th, and after a typical Spanish continental breakfast Maria meets us in reception to accompany us back down the cobbled street where David is awaiting us with the coach. Maria tells us it was –2 degrees during the night but anticipating cold weather we were all well wrapped up and keen to get started on our first excursion. 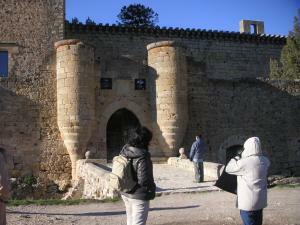 Ávila is one of Spains highest cities and in winter is noted to be the coldest. Snow is on the surrounding Guadarrama montains and flurries reach down to the motorway when we arrive, unfortunately, reducing visibility of the normally fantastic view of the majestic walls as we approached. We did however stop as we departed at the famous viewpoint “Cuatro Postes” where we all braved the cold once more for a group photograph and this was when the full panorama behind us unfolded, albeit at little hazy. A city oozing history, an amazing cathedral started in the 12th century in the Romanesque style with further building in the 16th century it is noted to be the first Gothic cathedral in Spain. So much to see and absorb, impossible in such a short time but Ávila will be remembered as another place on that ever increasing must revisit list but for a longer period sometime in the future. In discussion with us Maria agreed that she would try and obtain permissions from the Local Police of Segovia to bring the coach within the city walls and as near the main square as possible and with a seductive phone call each day using her female charms, and telling them that she had a coach with load of old fogies on board (true, I heard her each time) about 10 minutes before arriving. Obviously taking pity on us, this special permission was duly given. Rather than a slog uphill we now had a downhill walk back to the hotel after each day out, a lot easier (except for the simulated limping and shuffling to make the deception credible). Wednesday 26th. 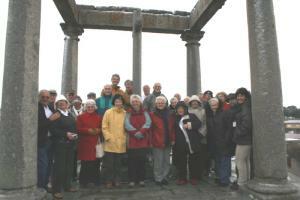 and our full day excursion “Pueblos Serranos”. This morning Maria tells us that it is –4 degrees outside but it is brilliantly clear. The views from Segovia of the surrounding mountains and countryside white with snow are spectacular, the air so fresh, especially after the heat and humidity of our summer gone, bode well for the day ahead. Our first and major stop this morning is La Granja de San Ildefonso, perhaps the Spanish equivalent of Hampton Court Palace, La granja was founded by Philip V in the 18th. century and until the early 20th. 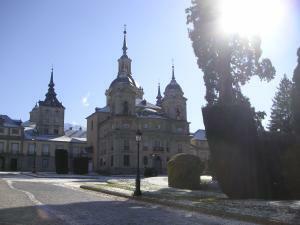 century was the Spanish Royal Family’s summer palace. Security here was much like an airport, or indeed like visiting Buckingham Palace, and a little time consuming not least because it was unexpected, but well worth the effort. Very well kept rooms that were again brought to life by Maria describing the finer points of the magnificent tapestries, paintings and other works of art. The beautifully kept gardens lightly covered with snow extending back to the lower slopes of the mountains giving a clue to their delight in summertime. Visiting the National Museum of Tapestries within the Palace leaves a feeling of awe. Around the palace a village has developed over the centuries for the estate workers and also encompasses the famous Royal Glass Factory started in 1770, which from that date to the present time produces prestigious crystal objects using the most advanced techniques. Many of the group visited the Museum of Glass during the free time allotted to us to browse and take lunch. After our lunch break we head off to the Rio Duratón Natural Park and the village of Sepúlveda situated on the “Sickles” of the river. Named because these bends are in the shape of sickles having over thousands of years scythed through the rock to form deep valleys. This village is thought to be the birthplace of the Romanesque architecture of the Segovia province. We visit the well-presented Centre of Interpretation of the conservation and management of the surrounding natural park. This is a highly protected area with Riparian Forest along the river banks mainly of poplars, natural low habitat for the Duponts Lark and many species of raptors such as Griffin Vulures, Egyptian Vultures, Kites, Kestrels and Eagles etc. etc. Time to take the sleepy village café by storm, Coffee and Brandy the order of the day. Not only are the bar-staff overwhelmed by a group, in winter?? But a crazy British group to boot! To be fair they cope very well and the till fares even better. 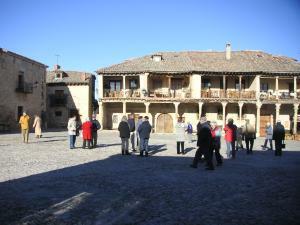 Back on the coach and off to the even smaller (and almost deserted) village of Pedraza. Completely walled and perched on the pinnacle of a small hill this is reminiscent of Guadalest behind the Costa Blanca but Pedraza has yet to be found by the masses and the financial benefits, or ruin, of tourism. With its 13th.century castle, the Church of San Juan Babtista, and imposing names such as Plaza Mayor and Calle Real this is as we envisage real Spain of the 18th century. Only one narrow entrance gatehouse in and out of the walls and still to this day the huge door is locked each evening when the Townhall bell tolls 11.00pm. Give prior notice if you are intending a late night out or find accommodation elsewhere for the night is the order of the day here. No doubt a popular spot with Segovians during summer weekends we see it with the only life around---a couple of workmen and two or three locals. We now head back to Segovia and the hotel. Tonight is special and we need time to prepare.